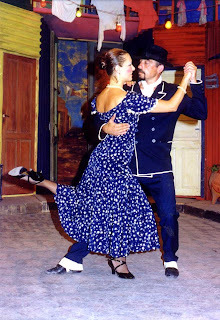 Tango city is a tour to travelers that arrive to our country and to feel Tango’s lovers . A thematic tour to discover the magic town that surprise the tourist.its music, dances, villages, the stories, mysteries an legends. Everything about Bs.As., and more, a clasp’s gold to be protagonist of the tango and the silver’s queen..City tour to emblemathic town and Tango’s places: La Boca, Caminito, P. Lezama, Av. de Mayo, Abasto, Av. Corrientes, Obelisco, San Telmo...Supper Show and "milonga", orchestra’s life and dancers. You can drink and eat the best typical Argentine’s foodsBus and permanent guides and two international dancers with us all time.Guides and more of everything that you can imagine it…..